I am very fortunate to live 20 minutes away from central London and dining in London restaurants is one of my favourite things to do. Ollie and I love finding new and exciting restaurants because we are obsessed with food. 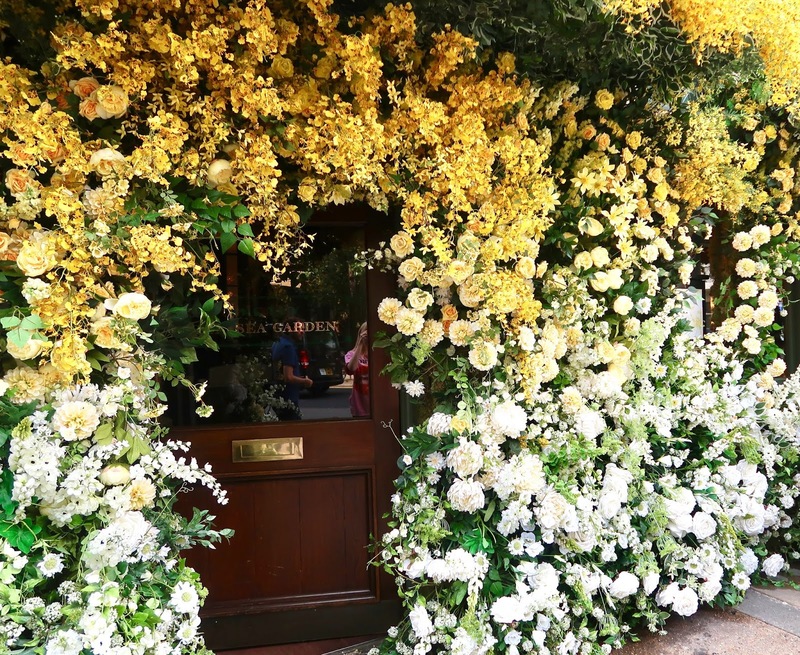 We've been writing a restaurant bucket list for quite a few years now and on my list, the Ivy Chelsea Garden on King's Road has been floating at the top. The day after I arrived back from Paris with Ollie, Lydia and I made our way up to Chelsea in the early hours of Sunday morning. We wanted to take blog photos in Chelsea because the Chelsea in Bloom show was almost at an end, you might have seen my blog post from earlier this month. Not only did I take some photos outside the Ivy Chelsea Garden but we had also had the chance to eat from the incredible brunch menu inside the restaurant. 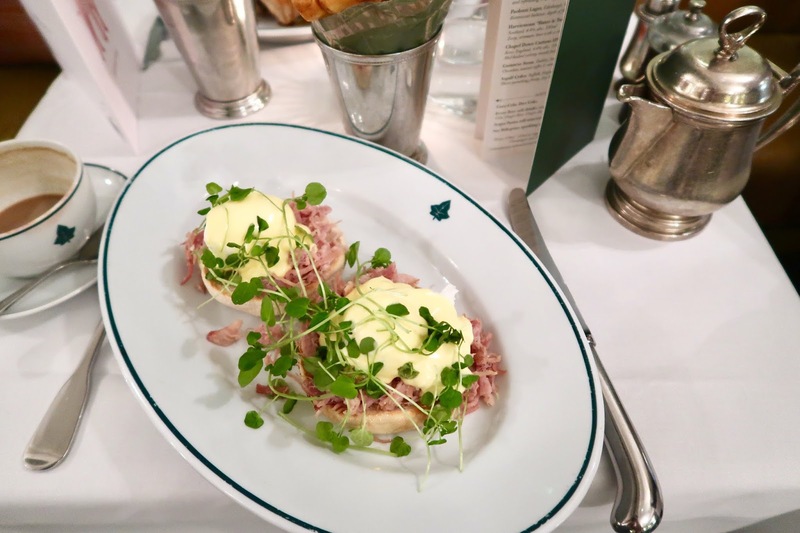 The interior is incredibly luxurious and if you are looking for a glamorous way to start your Sunday, I can't recommend the Ivy Chelsea Garden enough. Served from 11:00 a.m. to 4.:00 p.m., the brunch menu is a mouthwatering slice of heaven and I am pleased to say that I am not exaggerating. The menu is bursting with luxurious options and for a restaurant located in the heart of Chelsea, I expected the prices to be a lot higher. 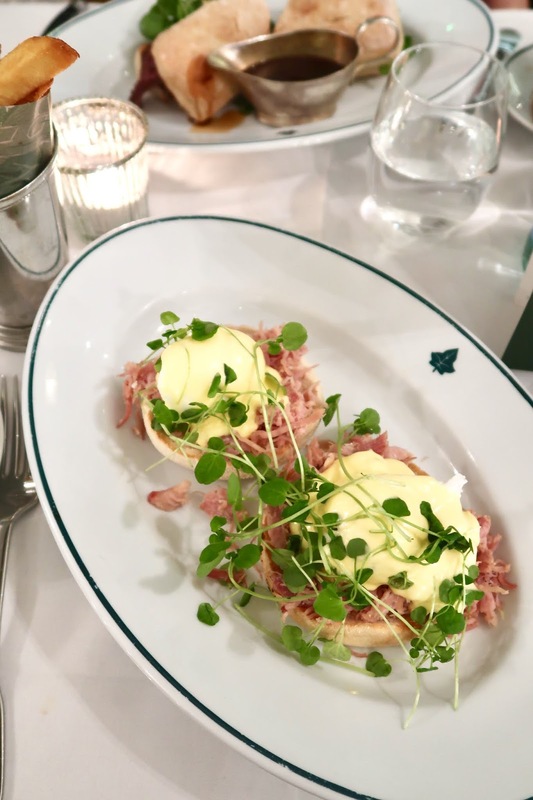 I decided to order the Eggs Benedict and chips and I don't know about you but I have never been served chips with Eggs Benedict or Eggs Royale. I personally found it a weird combination when I spotted it on the menu but the chips oddly made a great companion for the Hollandaise sauce and the eggs. 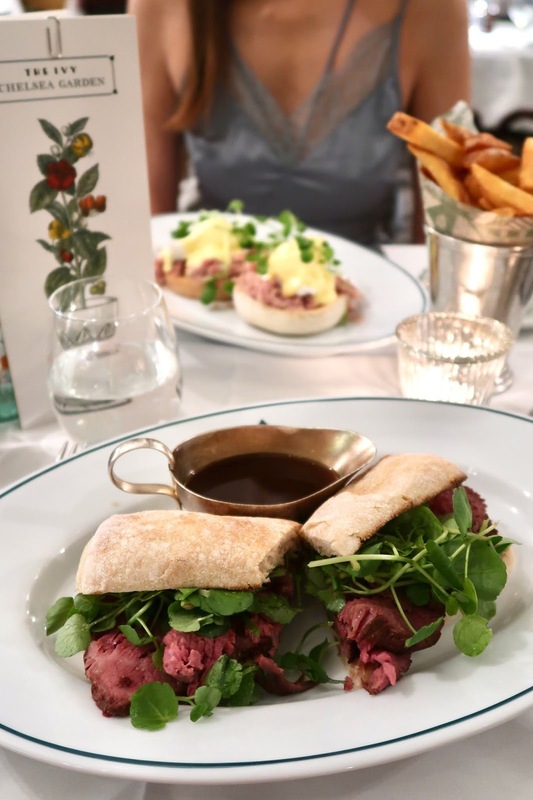 Lydia ordered a Steak sandwich "French dip" - the sandwich arrived with layers of roast beef and caramelised onions, horseradish mayonnaise, Burgundy sauce dip and of course, the thick chips. If you are feeling quite hungry, Lydia's menu selection is a great choice. The portion size was incredible! My Eggs Benedict order was perfection personified, the English muffin was lightly toasted and I loved the presentation of the dish. I had a cup of coffee with my main and it was lovely to see classic, sophisticated plates and saucers used. I really love the strong English vibe throughout the restaurant. Oh my gosh, that food looks incredible!